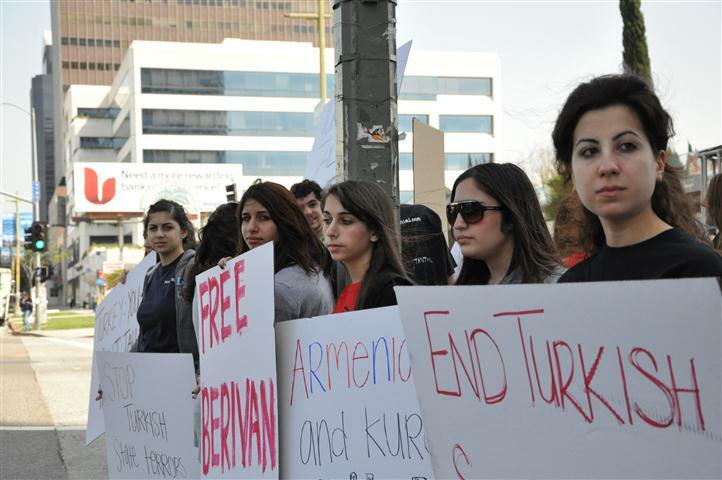 LOS ANGELES  A coalition of Armenian and Kurdish organizations gathered in front of the Turkish Consulate on Wednesday, March 24, to demand the release of 15 year old Berivan, a young Kurdish girl sentenced to 8 years in prison on trumped-up charges of terrorism in Turkey. Organized by the United Human Rights Council (UHRC), the protest brought together several Armenian and Kurdish youth organizations, including the Armenian Youth Federation, the ARF Shant Student Association, American Kurdish Information Network, and the Kurdish American Youth Organization. Berivan was detained last October at a pro-Kurdish rally in Turkey for allegedly shouting slogans and throwing stones. Berivan pleaded not-guilty, contending that she was just watching the rally on the way to her aunts house. Throughout the protest, demonstrators read excerpts from letters Berivan has written to friends and family, detailing her countless beatings from officers, coerced confession of guilt, and other hardships she faces in jail. Fact sheets, bearing her picture and story, were passed out to pedestrians while poster boards with slogans such as, Turkey: Stop Jailing Kids, were held for rush hour commuters on the crowded Wilshire Boulevard to see. A Turkish flag and a sign reading, Arrest the Oppressors, Free the Victims hung inside a makeshift eight-by-eight prison cage constructed by the protesters. The cage, placed on the sidewalk for passers-by to see, represented the plight of Berivan and the more than 2,600 minors trapped in Turkish prisons. Azad Moradian, Executive Board member of the Kurdish National Congress, condemned Turkey’s brutal practices and said that if it ever wants to be part of the international community, “it needs to start respecting its minorities. Moradian saw the demonstration as a call for the freedom of speech and expression for Turkeys minorities. How else do they expect to join the European Union?, he asked, alluding to the need for Turkey to remove its restrictions on free speech. Fertig, who was the demonstration’s keynote speaker, explained that he has been a proponent of Kurdish rights in Turkey ever since he was President of the Humanitarian Law Project (HLP) when he was asked by Kurds to investigate their claims of oppression from Turkish Armed Forces. He traveled to Kurdistan and developed a report detailing the abuses he witnessed and clarified that the Kurdish protests were a legitimate liberation movement, thus subject to protection under international law. He presented his findings to the United Nations Human Rights Commissions, but was met with opposition in the United States. Fertig was charged under the US Patriot Act for supporting a terrorist organization. He is currently appealing to the Supreme Court to end the curtailment to his freedom of speech. His appeal was heard this past February and he is now awaiting the courts ruling. “We will keep demanding Berivans freedom, we will keep fighting for the freedom of the 2,600 other children who are in prison throughout that country and we will keep demanding justice for all minorities who are denied their basic human rights within Turkey, she exclaimed. The protest ended with the releasing of doves, which Shirinian said, represented freedom for Berivan and all the other minors currently detained in Turkish prisons today. Click here to see more photos and videos from the protest on the Haytoug Blog.